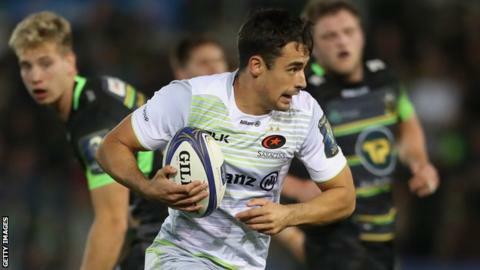 Saracens back Alex Lozowski has signed a new contract keeping him at Allianz Park until the summer of 2020. The 24-year-old former Wasps player featured twice for England on the tour of Argentina in the summer. There had been speculation Lozowski might leave the north Londoners in search of regular game time as he is stuck behind England's Owen Farrell. "In his brief time at the club, Alex has shown how good a player he is," director of rugby Mark McCall said. Lozowski, who can play fly-half as well as across the backline, has scored 214 points in 26 Premiership appearances since his switch to the capital in the summer of 2016, and helped Saracens retain the Champions Cup last season. "Alex will have an important role to play for us as he continues to develop as a player," McCall added. "The most exciting thing for us is how much improvement we believe there is to come from him alongside our core of young, hungry, homegrown players." This is significant news given he had been open to a move away from the club to play more regularly. England back Owen Farrell is the first-choice number 10 at Saracens, but McCall told Radio 5 live recently that Lozowski could become an England regular by staying at Sarries. Lozowski, who can play across the back line, is in contention to be selected in Eddie Jones' autumn international squad, which is announced next week.